Faceted red onyx silver pendant. 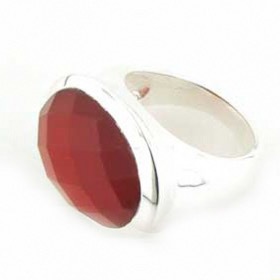 This red onyx gemstones is wonderful - a gorgeous spicey brick red colour with a cushion checker cut, faceted surface. Checker cutting creates a multi faceted surface which resembles a checkerboard as each face is square. This allows the light to reflect off many surfaces or facets creating sparkle and glisten. 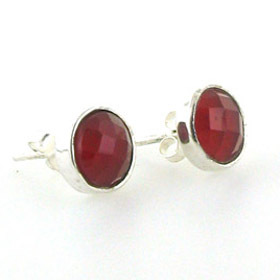 The onyx gemstone is set in a classic plain sterling silver setting. For a multi-stone necklace, see our red onyx necklaces. The chain we chose to complements this red onyx pendant is our silver ball chain, width 3.5mm (see below). 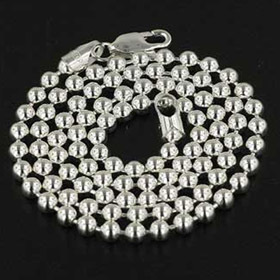 This is a classic and popular ball chain which can also be worn alone as a silver necklace. To make your own choice of chain to wear with this red onyx pendant see our collection of Italian sterling silver chains.